At the height of the season, An Post staff were delivering over 100,000 parcels per day nationwide. AN POST HAS experienced its busiest Christmas season to date with parcel volumes up 50% on last year. At the height of the season, An Post staff were delivering over 100,000 parcels per day nationwide, it said. Overall parcel volumes over the Christmas period are up 50% on last year. An Post also said that sales of more traditional Christmas stamp booklets were up this year following a number of years of double-digit decline. International stamp sales also increased, which An Post said was on the back of new products and a new Christmas campaign. In total, 13 million Christmas stamps were sold by An Post. “Christmas business exceeded the expectations of many of our retail customers. 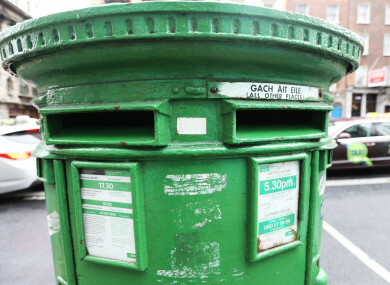 One major customer said they have never seen anything like the peak business generated by Irish shoppers,” An Post’s mail and parcels managing director Garrett Bridgeman said. An Post’s national parcels network has now begun to deal with post-Christmas and New Year sales and returns. Email “An Post experiences busiest Christmas season to date”. Feedback on “An Post experiences busiest Christmas season to date”.